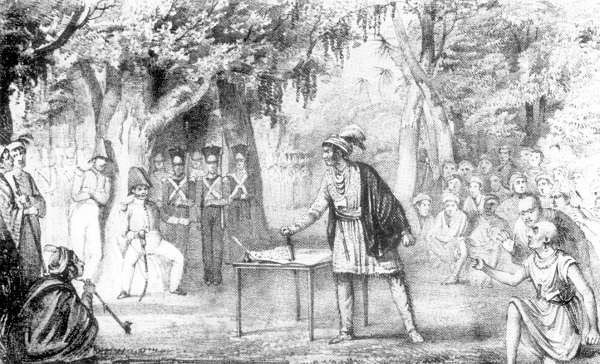 Osceola allegedly knifing the treaty of Fort Gibson, from the drawing in Andrew Welch's 1841 sketchbook of Seminole history, A Narrative of the Early Days and Remembraces of Oceola Nikkanoche ... .
Welch was something of a sensationalist. He once invited audiences to watch him dress the wounds of a woman scalped by the Seminoles. After the war he adopted a young Seminole reputed to be the nephew of Osceola. He briefly toured England promoting the boy's story and his own sketchbook of Seminole history. The sketchbook included an entertaining diatribe against the U.S. position in the war, but the work conflated and exagerrated facts and was often outright inaccurate.